Mr McNab will be presented with the award during the University’s ceremonies on Plymouth Hoe after a writing career that has seen him publish numerous fiction and non-fiction books, including Bravo Two Zero, which is widely credited with launching the modern military page-turner. Awarded both the Distinguished Conduct Medal and the Military Medal during his military career, Mr McNab was the British Army's most highly decorated serving soldier when he left the SAS. Endurance swimmer and ocean environmentalist Lewis Pugh is to receive an Honorary Doctorate of Science during the week. Mr Pugh is the only person to have completed a long distance swim in every ocean in the world, and will be awarded the doctorate in honour of a career that also began in the military, before moving into law and advocacy for the oceans. Also among the 2015 cohort are acclaimed poet Alice Oswald, who will be awarded an Honorary Doctorate of Arts; acoustic folk and roots band Show of Hands, who will receive Honorary Doctorates of Music; and Rear Admiral Ben Key, who will be awarded an Honorary Doctorate of Technology. In total, around 5,000 students will graduate during the week, bringing in more than 20,000 visitors to the city, and contributing a calculated £2.5 million into the local economy according to a recently commissioned impact report. 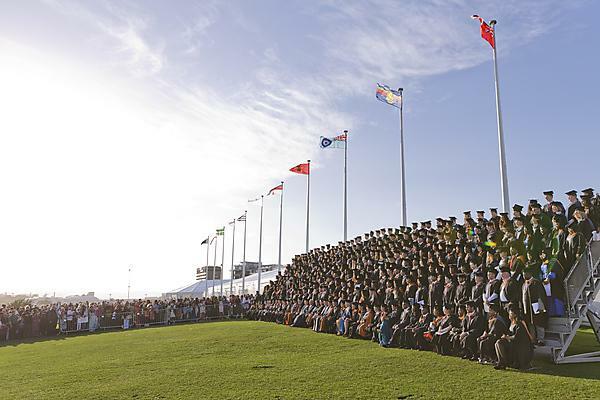 The marquees on the Hoe will host a number of events in the week preceding Graduation. They include St Luke’s Hospice’s “Puttin’ on the Glitz” Ball on Saturday 19 September, and the dinner for the international Shallow Survey Conference on Thursday 17 September. The University is also hosting a special fundraising event for Brain Tumour Research on Friday 25 September.